Thor Industries Inc. (THO) missed analysts’ expectations on revenue and earnings for the first quarter of 2019, sending shares plummeting 7.6% in premarket hours on Thursday. Net sales fell 21.3% to $1.76 billion versus the year-ago period. Net income dropped to $14 million or $0.26 per share from $128.4 million or $2.43 per share in the prior-year period. The quarterly results were significantly impacted by costs related to the acquisition of Erwin Hymer Group (EHG) which amounted to $57.1 million or $1.02 per share. Sales for the Towable RV segment dropped 21%, driven mainly by lower unit volume and higher discounts. 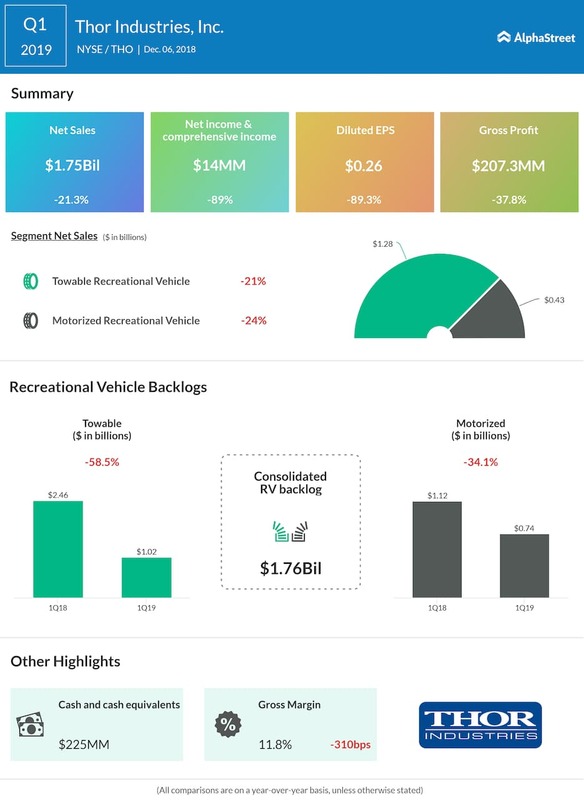 The backlog in this segment decreased 58.5% to $1.02 billion. Sales in the Motorized RV segment declined 23.9%, mainly due to lower unit sales. Backlog decreased 34.1% to $740.2 million, reflecting the impact of capacity additions on improving delivery times. In September, Thor announced the acquisition of Erwin Hymer Group, which is progressing according to plan. The deal is expected to close by the end of this calendar year and to be accretive to earnings in fiscal 2019, before taking into account anticipated efficiencies, purchase accounting adjustments and transaction-related expenses. Looking ahead, Thor remains focused on the long term and is optimistic about global growth opportunities. Retail trends in the RV industry, new customers and growth in demand for outdoor products and experiences are expected to boost growth for the company.